No matter what industry you are in, whether you sell to consumers or businesses or if you have an established digital marketing presence, email list building should be an integral component of your marketing. The fact is that of all of the digital marketing components that should be in place and working together for your marketing to be effective, email marketing is known to be among the most important! Email marketing has been and continues to be one of the top digital marketing channels for most industries and for many reasons. Not only has email been around longer than social media, paid media and video marketing channels, it is one of the most used and accepted digital marketing channels by consumers and business people alike. Since email marketing is permission based, your target audience has given you permission to communicate with them, and that allows you to market in a way that is direct and intentional. 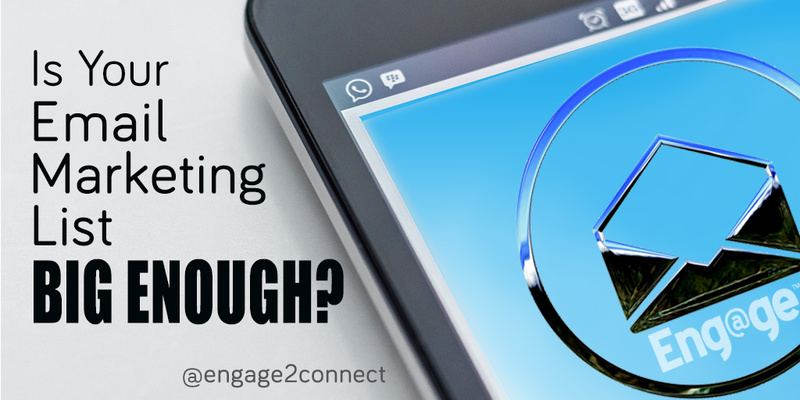 But do you have enough email subscribers to ensure your email marketing is working? List building in email marketing is something that rivals the importance of what, when and how often you are sending emails to your email list subscribers. For obvious reasons, the more customers and prospects that subscribe to your email list, the more opportunities your email marketing has to drive traffic, build relationships and bolster sales. But for retail businesses utilizing email marketing, it is important to understand the differences between customers and prospects. Based on research released by eMarketer last year, only about 1/3 of email list subscribers are actually customers. That means that the majority of most retailers using email marketing are distributing their email messages to non-customers that may or may not be opening or consuming the content within the electronic communications. This also represents a significant need for brands to be extremely conscious about what they are sending to their list and how often. Additionally, brands likely need substantially more email subscribers if they want to maximize their reach, traffic and sales derived from their email efforts. The eMarketer study provides some statistics that every brand should be aware of. Email marketing can be effective, but only if it is done properly. Therefore brands need make sure that what they are communicating within their email marketing messages takes list segmentation into account when creating their email content, as well as the frequency of the email communications they are sending. 1– Only 15% of email list subscribers stated that they had made multiple purchases from a retailer they were a customer of. 2– 2/3 of consumers who receive five or more retailer emails per week stated that they receive too many retail marketing emails. 3– Of internet users who receive five or fewer emails per week, just 21% find they receive too many marketing emails. The consumers who were surveyed in the study were referring to all email marketing messages they receive, and not just referencing the content or frequency from a single retailer. However, it is clear that consumers who receive email marketing messages from brands have a threshold of frequency that either positively or negatively impacts their receptiveness to email marketing from retail brands. Furthermore, brands should be taking a second look at what content they are sharing to their entire email subscriber list and evaluate whether the messages are properly positioned to 2/3 prospects and only 1/3 customers. Consumers are still very receptive to emails from brands they want to keep up with. In fact a study released by Mapp Digital indicates that receptiveness is still extremely strong by consumers ages 18-64. The study further explains that 77% of customers don’t use a separate email address to filter marketing emails, and around 72% subscribe to upwards of four email marketing lists from different companies. But what should you be sending to your email subscribers to build loyalty and convert subscribers to actual customers? Being receptive to receiving email marketing messages from a brand, versus opening and/or taking action on those messages are entirely two different things. Where many brands fail with email marketing is not placing enough emphasis on growing their email subscriber list to ensure it is large enough to gain traction with both customers and prospects alike. Finally, brands must ensure that they have an effective strategy for email content that works by creating content that delivers value to your target audience, not just offers and deals that push your products and services. Build trust through the email content that you are sending customers and prospects, rather than making your email marketing simply a pitch machine. By giving your customers and prospects valuable email content that interests them, along with incentives and promotional offers, you increase the benefits of your email messaging and establish trust that will result in better relationships and more sales.